The month of June... a wonderful time to think about all of the "Men in our Lives"... so that's exactly what we did. We, as a Design Theme decided on this theme together. 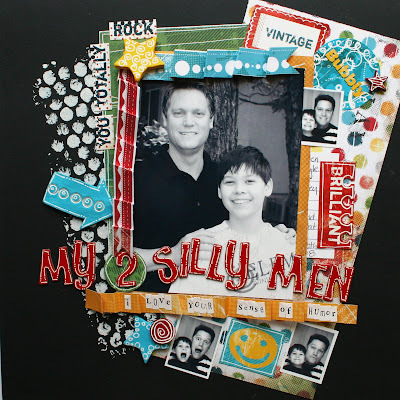 We hope it will inspire all of you to scrapbook the memories (from long ago or right now) of YOUR MEN! Thanks for taking a look. 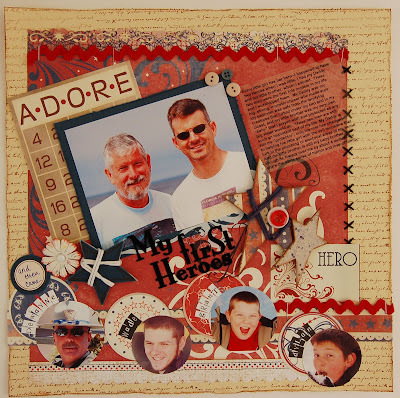 Here's Trish's layout... with such a wonderful memory of her daughter and husband. 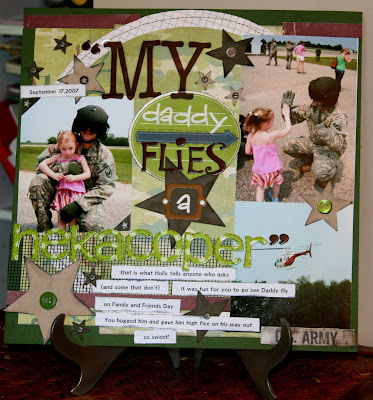 The title is so fun and the layering of papers and embellishments makes this layout a real winner! She used papers from Dream Street's Clubhouse line, and some thickers from American Crafts. The hand cut stars really draw your eye right down the page... awesome job Trish! Awww, isn't this the sweetest page about Debbie and her "men"! Debbie's design is so pleasing to the eye... and I especially love the 3 hearts that run down the side... super cute! Debbie use the Sassafras Lass Robotics line for this layout, it's awesome to see these papers used in a non-themey way. She also used Bazzill edges in orange, a Scenic Route chipboard alpha in brown and some Fancy Pants flourishes for a finishing touch. Thanks for sharing your special birthday moment with us Debbie, you rock! Morag's MAN is next up! I love seeing this beautiful picture of Morag and her DH, love this formal color combination and all of the lovely details that makes this page so beautiful! Morag chose the classy Teresa Collins Damask Collection for her patterned paper line and enhanced the layout with flowers by Bazzill and little letters by Making Memories. Just a beautiful layout Morag. 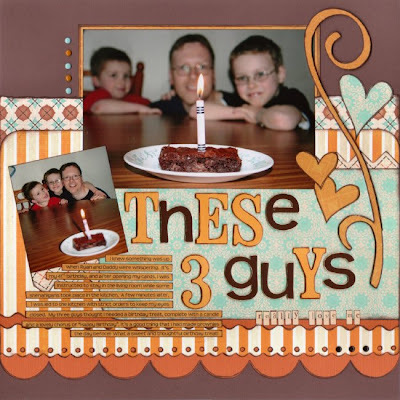 Kay showcased her favorite MEN with the fun and funky layout using Cosmo Cricket's Get Happy line of papers and stickers! I love how the black and white photo pops of the papers and how all of her embellies surround the photo. But do you know what I like the best?! The awesome bubble wrap painting technique. Isn't that SO COOL? ?, and it matches the dot paper! She also used American Crafts thickers, Making Memories little letters and some clay shapes that she made and painted. Awesome job Kay, thanks for sharing! Wow, Kary is lucky enough to have lots of MEN in her life! :P and this awesome layout really showcases all of them! Those little round pictures are so pefectly placed, and really give us a look at her life. She chose to use the Rusy Pickle Bottle Rocket's line for her project, and the colors are really fun! 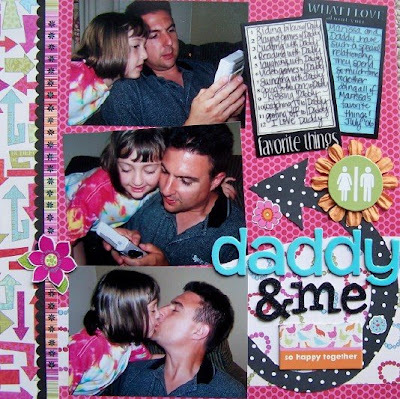 She also used embellishments from the My Mind's Eye Lush Blooms collection and little letters by Making Memories. 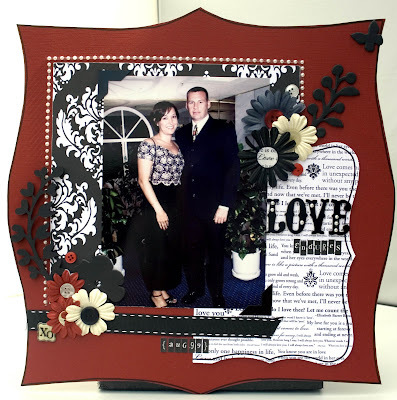 As usual Kary's layering makes the layout so dimensional, love it Kary! Only one Man in my life, cuz I live in a house full of girls.... and here he is. My MAN and my youngest DD.... I think he is her best friend. They spend so much time together. :) I used some older Scenic Route for my layout, the Laurel line of papers and embellishments, and I must say that I still love this paper. But I had fun updating it with some new fun finds... such as these Maya Road sheer journaling blocks (notice how you can add colored paper to the back of these to make them look totally different), these Scenic Route chipboard letters and some glittery American Crafts letters too. I also added these fun Scenic Route rubons. Thanks so much for checking out what we've been working on!!! WOW - such varied layouts! Who knew that men could be so stylish?! wow, it's sooo nice to see LOs done about the Men !! !